DALLAS (AP) — Carmelo Anthony scored 15 of his 19 points in the first quarter to jump-start the New York Knicks’ 92-80 victory over the Dallas Mavericks on Sunday night. New York led by as many as 19 points and held off a second-half rally that pulled the Mavericks within six. The Knicks went 2-1 on a four-day trip through Texas. Dirk Nowitzki had 18 points and nine rebounds for the Mavericks, who lost their fourth consecutive home game. Their previous low score had been 87 points twice this season. The Knicks had allowed a season-low 78 in a victory at Chicago on Dec. 11. Anthony scored six points during a 12-0 run in the first that gave the Knicks a 24-13 lead. He also led New York with four rebounds, three assists and two steals in the quarter. He finished with seven rebounds, five assists, three steals and a blocked shot. Kenyon Martin scored six points in a 1:13 span early in the third quarter that gave New York a 58-39 lead. Filling in after starting center Tyson Chandler left because of illness, Martin had 10 of the Knicks’ 15 points in the quarter and finished with a season-high 14. Anthony didn’t score in the second quarter, but New York outscored Dallas 23-18 to lead 52-35 at the intermission. The Mavericks shot 36 percent (13 for 36) from the field in the first half and were 0 for 8 on 3-pointers. Dallas missed 8 of 17 free throws, including four by Nowitzki. He was 3 for 7 from the field and 5 for 9 from the foul line to finish with 11 points and seven rebounds in the half. The 35 points were the Mavericks’ fewest in the first half this season. The Hawks held them to 34 in the second half of an 88-87 loss at Atlanta Nov. 29. 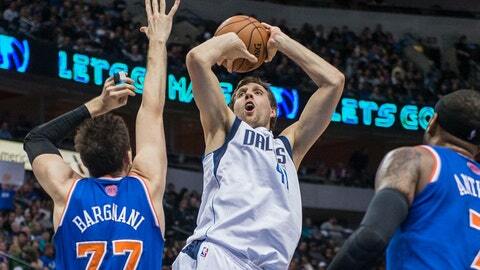 The Mavericks rallied from the 19-point deficit at 58-39 with an 18-7 run that reduced New York’s lead to eight. The third quarter ended 67-57. NOTES: Knicks starting center Tyson Chandler left because of an upper respiratory illness after playing the first 4:25. Martin replaced Chandler after missing Friday’s game at Houston because of a sore left ankle. . Metta World Peace was not with the Knicks for the fourth consecutive game. He has said he would undergo platelet-rich plasma therapy Monday in New York. New York coach Mike Woodson said, "We’ll know more when we get back." . This was just the fourth time the Knicks have won as many as two games in a three-game trip to Texas. They defeated San Antonio on Thursday before losing at Houston. . The Mavericks’ Vince Carter played in his 1,100th NBA game. . Nowitzki had one steal, leaving him one short of 1,000 for his career.